Mike Ullery | Daily Call Piqua Power crews erect a Christmas Tree made of lights on top of a portico at the Piqua Public Library on Wednesday. Piqua Power crews erect a Christmas Tree made of lights on top of a portico at the Piqua Public Library on Wednesday. 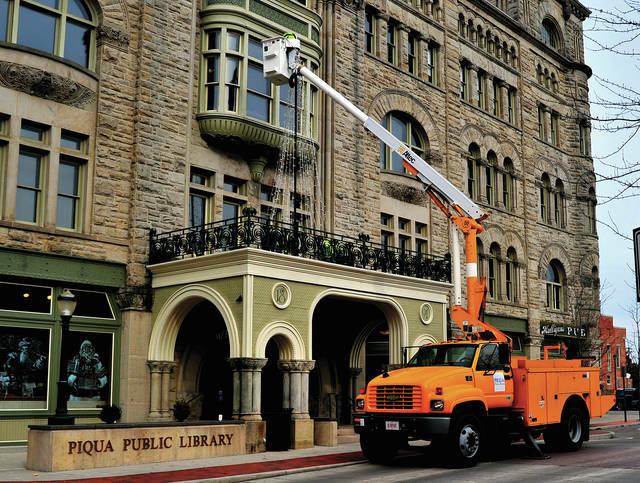 https://www.dailycall.com/wp-content/uploads/sites/30/2018/11/web1_111418mju_piqualibrary_tree.jpgMike Ullery | Daily Call Piqua Power crews erect a Christmas Tree made of lights on top of a portico at the Piqua Public Library on Wednesday.